The Charente – A Truly Perfect Location in Paris! Pour yourself a glass of wine (French, of course! ), sit back and let us introduce you to the Charente, an exquisite one bedroom apartment in the heart of the stylish Saint-Germain-des-Prés neighborhood in Paris. Set in a perfectly preserved late 17th-century building full of Parisian charm, this apartment has historic boiserie wood paneling and ornate crown molding, original wood floors and the tallest windows we’ve ever seen in a Paris apartment! 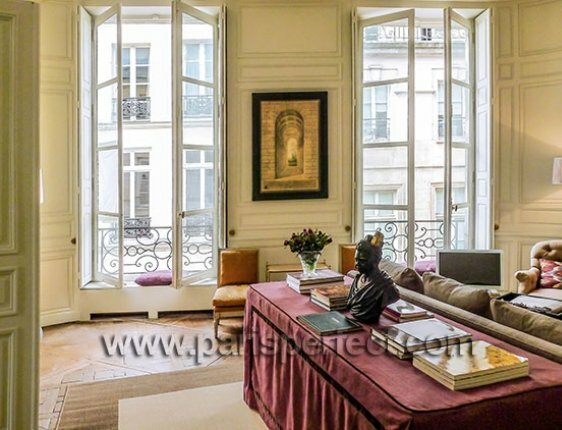 Impeccably decorated with an artistic touch and fine artwork, this apartment offers an elegant stay in one of the most elegant quartiers in Paris. 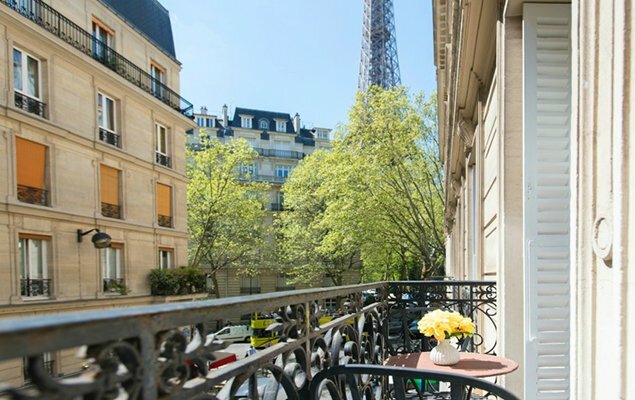 Set on a lovely street between the Seine and Place Saint-Germain-des-Prés, you can walk to the best shopping areas of Saint-Germain, stroll along the Seine and cross over on picturesque Pont des Arts, walk to the Musée d’Orsay, the Louvre, the Ile de la Cité and Notre-Dame Cathedral and so much more. You’ll fall in love with the Parisian neighborhood outside your doorstep. Just around the corner there’s Ladurée, the perfect spot to find warm croissants in the morning and delicious pastries and desserts to enjoy at home. 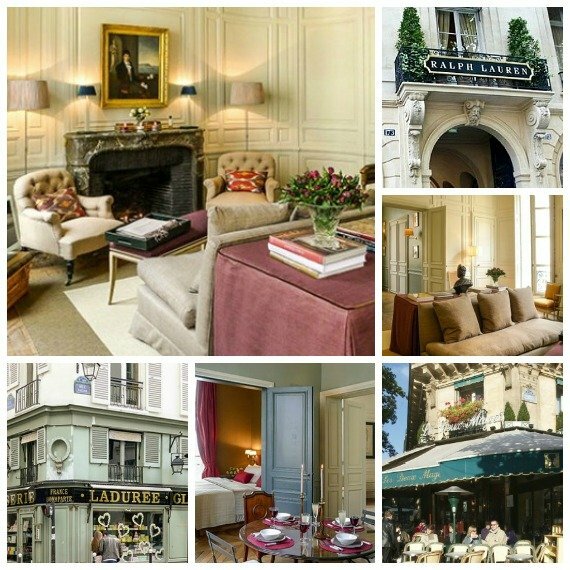 When you stay at the Charente you’ll be just around the corner from Ladurée … ooh la la! The bedroom at the Charente is a dream … with its sumptuous king size bed, built in cupboards hiding storage and a flat screen TV and the same soaring ceilings and gorgeous windows. Guests have been raving about the Charente apartment with its fine décor and outstanding location in the 6th arrondissement. Here’s a review that offers a glimpse into all the charms of the Charente from Annie Fitzsimmons, Intelligent Travel’s Urban Insider for National Geographic. Thank you, Annie, for sharing about your experience with Paris Perfect! We invite you to read more reviews, enjoy the photo slideshow and find out more about the Charente vacation rental here. If you’d like to book a stay in the Charente, just Contact Us and our reservations team will be happy to help! Posted on Monday, January 27th, 2014 at 4:23 pm in Apartment Rentals. You can follow any responses to this entry through the RSS 2.0 feed. You can leave a response, or trackback from your own site.